Creekview Park	The park and Recreation Center lie on the east bank of Shingle Creek, providing a natural environment for walking and biking paths. Bike Path connects to Brooklyn Park. The park is on the east bank of Shingle Creek, a 12-mile waterbed that is home to many small mammals and birds. The playground features a 30′ high slide and is the only 3-story play structure in the Minneapolis park system. Athletic field #4 was upgraded with a grant from the Minnesota Twins. Name: The name of the park is taken from the creek. The creek’s name came from the shingle mills that once operated on its banks near the Mississippi River. The first petition from citizens for a park along Shingle Creek came to the park board in 1905, but that petition was targeted at land that later became Camden (Webber) Park. With the acquisition and development of Camden Park on the creek in 1908, there was little demand for more parks in the neighborhood for many years. In 1930 the park board received a petition from residents of the area for plans and estimates for the acquisition and development of Shingle Creek from Webber Park to the city limits. The park board extended the concept, asking park superintendent Theodore Wirth to prepare plans for Shingle Creek from Webber Park to its source at Twin Lakes in Robbinsdale in November of that year. The instructions perhaps were confusing because the creek does not flow from or through Twin Lakes, but originates in Eagle Lake in Maple Grove. Nonetheless in early 1931 Wirth presented the requested plans and estimates—and that was the last heard of Shingle Creek for another fifteen years. In a discussion of a proposed Hennepin County park authority, however, Wirth did produce a map in the 1930 annual report that showed the possible park developments in northwest Minneapolis and the northwest suburbs. He marked Shingle Creek on that map as a proposed acquisition within the city of Minneapolis and recommended a parkway along the entire length of the stream to Eagle Lake. The park board received no more requests for a park along Shingle Creek and the park board did not address the issue again either. Perhaps the demand for a park in the area was reduced when in 1935 the park board obtained from the city the site of the former city workhouse and converted it into Bohannon Park, which is only a few blocks from the creek. The impetus to acquire Shingle Creek as a park eventually came not from the park board or residents of the neighborhood, but from the city sewer department and city council. Following World War II Minneapolis experienced a severe shortage of housing and one area of the city that had yet to be developed for housing was the area of northwest Minneapolis surrounding Shingle Creek. The area hadn’t been developed because it was low, swampy land. The solution, in the eyes of city officials, was to lower the bed of Shingle Creek to drain the entire region and make it dry enough for housing construction. The city agency that could do it was the park board. Although the acquisition and development of Shingle Creek was not on the park board’s extensive “Postwar Progress” agenda, the park board went along with the city’s request to acquire the land for storm-water drainage purposes. 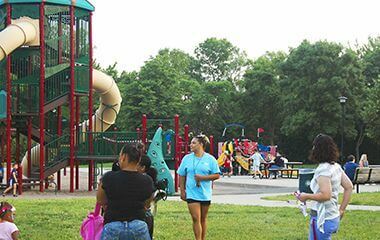 The city issued bonds for $270,000 to fund the project, more than would be approved for all but a few park projects over the next fifteen years. Bonds were, in general, not approved for projects which the park board considered to be far more pressing than acquiring Shingle Creek. The park board first designated for acquisition about seventy acres of land in a 300-foot-wide strip along two miles of the creek in 1946. The park board’s annual report of 1947 announced that the acquisition of the land had been started but not completed. Finally in 1948 the park board concluded transactions to acquire slightly more than 55 acres for the park with a few more acres added the following year. The total cost of the land was slightly more than $200,000. The park board’s reticence to acquire the park in view of more urgent needs may have been responsible for the slow development of the creek as a park. Tentative plans for the park were not introduced until 1951 at which time park superintendent Charles Doell noted again that the principal objective of the project was drainage and that provisions for a park were incidental. It took another seven years before work on the creek began. With another $280,000 in bonds, augmented by a $150,000 assessment on property in the area, the park board initiated the process of lowering the creek and grading the land around it. The board focused on the area between 50th and 52nd avenues north where it had developed plans for a playground in a joint project with the school board. Joint school and park developments had proven successful in the late 1940s and early 1950s at Waite Park, Armatage Park and Kenny Park and the two boards pursued a similar strategy at Shingle Creek. The creek bed was relocated, lowered and widened, and ball fields, a wading pool and tennis courts were built at what was later named Creekview Park along the creek. Construction of a recreation shelter was begun in 1958 and completed in 1959 near the site where the school board built Floyd B. Olson Junior High School a couple years later. The initial work at the creek lowered the creek bed by five feet. The lowering of the creek bed also required the relocation of the creek through Weber Park, which required moving some playground equipment, filling the old channel and slight enlarging the lagoon. 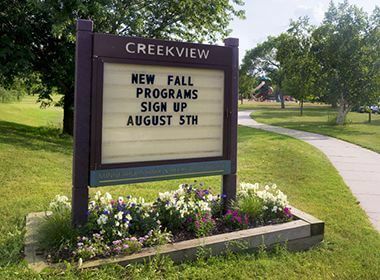 In 1977, during a construction boom in Minneapolis parks, the park board completed a new recreation center at Creekview Park attached to Olson Junior High (now a middle school) which allowed both park and school use of facilities in both buildings. The name of the Creekview Recreation Center was formally adopted in late 1976 to replace the unwieldy informal name of Shingle Creek/Bohannon Recreation Center. To ensure that there were no objections to the name, the park board sent notices home with students at Olson Junior High informing people of the proposed name change. When no objections were raised, the name was adopted. In 1979 a pedestrian and bike pathway along the creek was financed by a state grant and city bonds, and that winter the park board developed a cross-country ski trail along the creek. A renovation of the playground at Creekview was funded in 1980. Further improvements were made to the trails along the creek in 1993 and in 1996 a “Children’s Forest” of 150 trees was planted on the south side of creek. 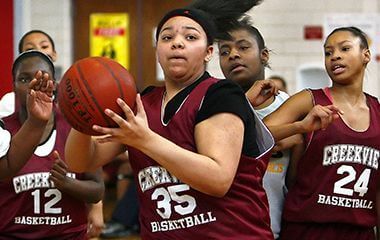 In 1998 an arson fire damaged the Creekview Recreation Center, but it was reopened in 1999. Extensive improvements were made to the playground at Creekview from 2005 to 2007. 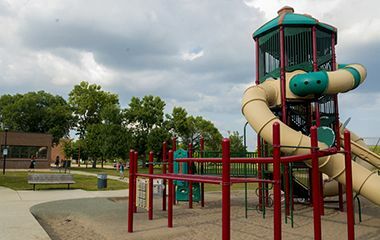 A skate park was built, a baseball field was upgraded with by a grant from the Minnesota Twins, new playground equipment was installed, and a computer lab was created in the recreation center. The playground features a 30' high slide and is the only 3-story play structure in the Minneapolis park system. Creekview Park is part of Shingle Creek Regional Trail. 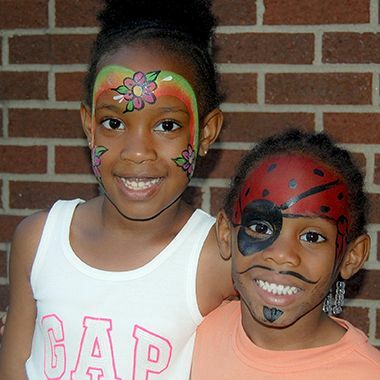 Creekview Recreation Center offers programming year-round.